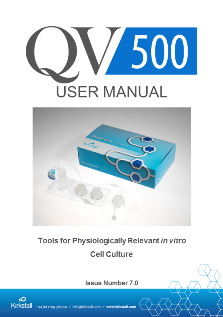 This User manual is specific to the Quasi Vivo® QV500 cell culture system. 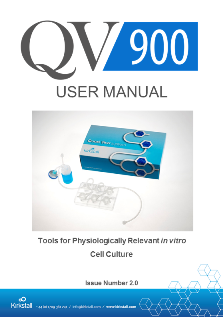 It is aimed at scientists to enable the transition from static culture to perfusion culture techniques. We advise that you read this document thoroughly before starting an experiment. The methods described may be adapted to suit specific applications. 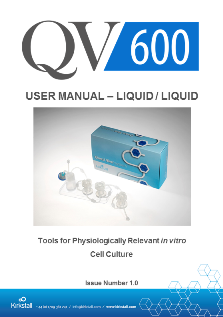 This User manual is specific to the Quasi Vivo® QV600 cell culture system for models of cells located on the interface of air and liquid. It is aimed at scientists to enable the transition from static culture to perfusion culture techniques. We advise that you read this document thoroughly before starting an experiment. The methods described may be adapted to suit specific applications. This User manual is specific to the Quasi Vivo® QV600 cell culture system. It is aimed at scientists to enable the transition from static culture to perfusion culture techniques. We advise that you read this document thoroughly before starting an experiment. The methods described may be adapted to suit specific applications.